Powerhouse Seafood Grill features delicious seafood, steaks, pasta, a great wine selection, and our famous Kilowatt frozen cocktail. Voted Best Seafood in NWA for over 20 years, we’re not just a seafood restaurant but a steakhouse delivering hand cut Angus steaks served daily. Powerhouse is unique in every way having been built in the 1900's to house the first electricity generators in NW Arkansas. We have two distinctive dinner areas with the front dining room and bar used for primary dining and our back dining room and bar used mostly for private events and parties. We also have private dining room seating up to 45 people. 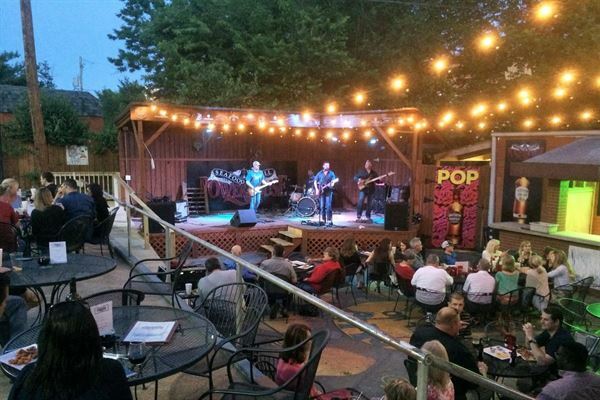 We also maintain a large outdoor patio with bar and full stage for your event needs. Whatever your event be it a private parties, wedding receptions, reunions, or business meetings, we have a space. Our completely private Banquet Room holds up to 45 guests comfortably. Featuring a large screen TV with HDMI hookups this room is perfect for all events from receptions to business meetings. Our Boars Head Pub Semi-Private is an option for those looking to book parties for 20-40 guests. This space is a section of our Boars Head Pub All Private. Space includes a full bar and easy access to bathrooms. Located along the main dining area but built for that 20 person group wishing to have a party or family gathering.